Learning to read is one of the first major educational milestones in a child’s life. The sense of pride and accomplishment that kids feel the first time they read a book all by themselves is something that neither you nor they will forget. Helping your child master the skills that lead up to learning to read will make the lesson an easier one for him to learn, instilling a love of reading and learning that can follow him throughout his life. While there are as many approaches to teaching a child to read as there are individual children, these 10 are some of the basic tips that can make the process less frustrating for you and your child. Start Early – Though you may not see results from waving flashcards in an infant’s face and repeating the alphabet as you prepare bottles, starting to read to your child while he’s still young can have a real difference in his eagerness to learn the skill for himself when he gets a bit older. Establishing a routine of reading nap-time and bedtime stories together while your child is still young will ensure that reading and books are a part of his life from as far back as he can remember. Phonemic Activities – When your child acquires phonemic awareness, it means that he has learned that words are a combination of phonetic sounds. Working with your child to develop phonemic awareness will help him learn an essential building block of reading skills. Before you focus on letters or proper spelling, make sure that your little one has a basic grasp of phonemes. Work on Story Print Awareness – Helping kids develop print awareness gives them very basic knowledge about books and reading, that words are read from left to right, top to bottom and that books open on the right-hand side. These basic skills are some of the building blocks of learning to read confidently. Master the Alphabet – Before your little one can learn to read, he has to learn the alphabet. Whether you teach him to sing the iconic song learned by generations of children or find your own method, it’s important to make sure that he understands the alphabet is made up of 26 separate letters that all make their own sounds and, when they’re put together, form words. Talk About How Sounds and Letters Are Related – After your child learns that there are 26 letters that make up the alphabet, you can start working on the way those letters are related to the sounds used to make words. Adopt a Reasonable Screen Time Policy – As more parents begin to understand the potential dangers of allowing too much screen time, some are moved to cut off kids’ access to electronics altogether. While allowing a child to spend hours watching cartoons may not be the best idea, there are some electronic devices that can actually be quite helpful and educational. Kid-friendly versions of laptop computers and eReaders with pre-loaded books and reading lessons can keep kids engaged and entertained, as well as help them master some fundamental reading skills. Choose Books Carefully – Once your child starts mastering the basics of reading, you’ll want to make sure that you aren’t getting ahead of yourselves. Books that are too simple may not hold his interest, but ones that are too advanced will only frustrate him and turn reading into a chore, rather than something enjoyable. The Phonics Method – The most popular method with most educators for teaching young children to read is the phonics method, which teaches children how to break words down and sound them out to decipher them on their own. Whole Word Learning – The whole word method of learning relies upon the Dolch sight word list, which teaches kids to memorize words on sight. Because some of these words cannot be sounded out using phonetic reading methods, whole word learning can be a great supplemental method to use alongside phonetic reading. Context Support – When you provide your child with context support, you’re creating an environment that supports reading. Reading together, making sure you set aside story time and even making lessons out of everyday situations are all ways of providing context support for your child as he learns to read. It’s important to keep your child’s developmental age and abilities in mind before beginning reading lessons in earnest, in order to avoid setting you both up for failure and disappointment. 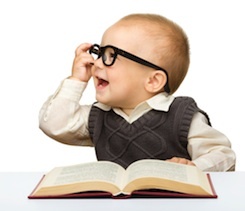 While television commercials may show infants gleefully reading or acting out the words on flashcards before they can walk, this simply is not the norm for most children. Be sure to keep his abilities in mind as you begin teaching him to read so that you approach the process with realistic expectations.